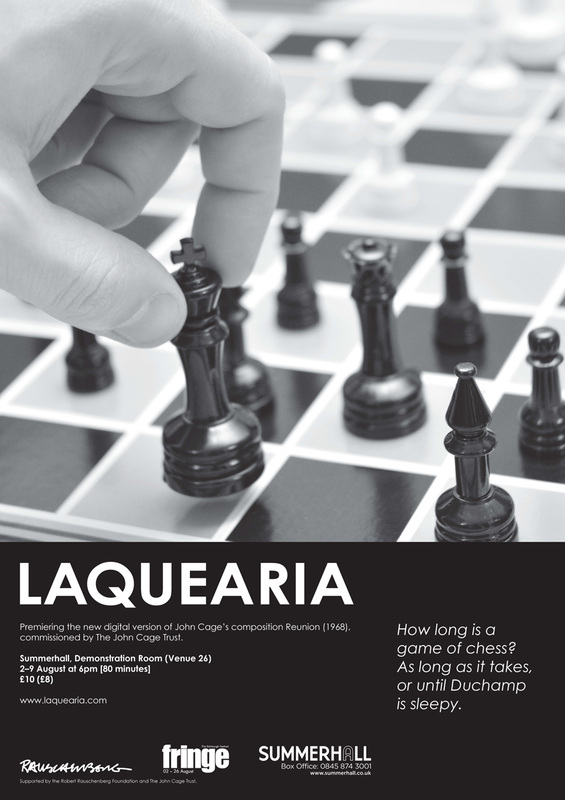 Laquearia* is a lecture-demonstration in the tradition of the maverick American composer, John Cage (1912 -1992). While drinking, smoking, and discussing friends and ideas—punctuated by the narrator’s clumsy interpretations—Samuel Beckett and John Cage play the game of chess described in Beckett’s novel Murphy (1938). This game provides the structure for the first performances of a new online version of Cage’s composition Reunion (1968). Laquearia and Reunion are performed in tandem, asking, and answering, the narrator’s question: could the game from Murphy be used as the structure for a performance of Reunion? Reunion (1968) is an event without a score; originally performed by playing a game of chess on a chessboard created by Lowell Cross. The game works as an indeterminate structure: as a game of chess is played, the moves of the players on the board activate four compositions and distribute them to eight speakers surrounding the audience. At the premiere of Reunion in Toronto on the 5th of March 1968, Cage played against Marcel and Teeny Duchamp, activating live compositions by Gordon Mumma, Lowell Cross, David Behrman, and David Tudor. The online version of Reunion—created by Dr Christopher Jefferson and Dr Ian Miguel of the University of St Andrews’ School of Computer Science—will launch with the first performance of Laquearia at the Edinburgh Festival Fringe. Jacob Carpenter Morris, Lynn Wright, and Marc Thorman have been commissioned to compose new works for this iteration of Reunion; it will also include Cage’s composition Chess Pieces (1943) to reunite the new version with the old. * Laquearia, from T.S. Eliot’s A Game of Chess section of The Wasteland in which the characters “flung their smoke into the laquearia.” Laquearia (pronounced lak-we-ä’ri-a) means panelled ceiling. It also refers to a genus of fungi. This project is supported by the Robert Rauschenberg Foundation and The John Cage Trust.